SWAN Day Allegany County NY 2018 Activities. 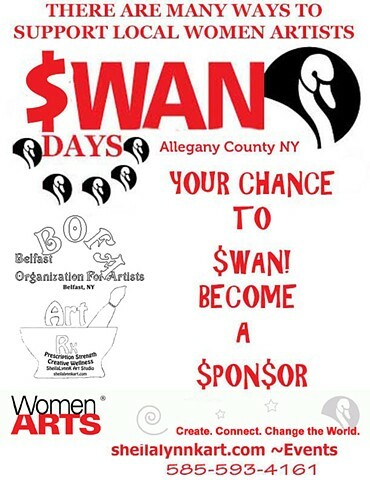 ALL Funding Raised Will be Used to Support Local Women Artists and Future Allegany County NY SWAN Day Events. (Excludes fees at checkout) An annual funding report will be posted on the event page. Payment Confirmation Received by Feb 25, 2018 will ensure that you are included on PRINT publications. Payments Received After Feb 25, 2018, you will be added to the digital versions utilized on Social Media and included in any subsequent printings or publications for SWAN Day Allegany County NY 2018.